The weather has been cold all week and this causes a change to watering in the school greenhouse. The warm sections (Warm Asia and Warm Americas) have the heaters working hard an so plants here need extra watering. Conversely, the cooler ends are properly cool but have almost no heating on, as some heat passes through from the warmer sections, so we reduce watering in the cool sections. The cool weather suits our cool growing Masdevallias which are full of leaf growth and flowers such as this species which is one of our most robust and reliable Masdevallias. Masdevallia lappifera is a species from Ecuador. 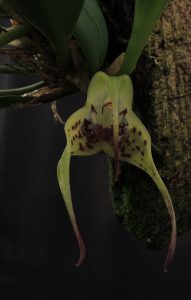 The large flowers are produced on short stems and are remarkable for the purple ‘hairs’ on the lip which give the species its name meaning the burred Masdevallia. The species is found at around 1200m altitude and with us flowers several times during the year. The flowers are long lasting and so this is a plant that often comes with us to shows. We grow it mounted in Cool Americas.